Zola, Tesla and Roma – rescued from a puppymill. Many thanks to Tom of Pilots N Paws for transporting the Girls from a shelter in Iowa. These girls lived their lives for five years in cages at a puppymill. They are timid and afraid and do not know the ways of a “normal” furkid life. They are flight risks (they will run away) so we must be very careful with them. Zola, Tesla, and Roma are not ready for adoption yet. Watch for more updates as we begin to work with them. If you would like to make a donation toward their care, please do so at PayPal (info@eskierescuestl.org) or AER, PO Box 190523, St. Louis, MO 63119. We will need help with these three as they will require medical care, training, and special handling. Thank you very much! Be sure to check out the additional pictures. MEDICAL FOSTER HOMES ARE NEEDED, PLEASE. This year has been terrible for rescue dogs coming in with kennel cough. AERSTL is in need of foster homes without any pets to take care of a dog with kennel cough for about 2 to 3 weeks. Medication would need to be given. Most of the time, the dogs do not feel well but once they begin taking medications they soon get better. If you can help in this way, please call 314-647-1112. Rescue dogs with kennel cough must be isolated from other pets so this would really help. Thank you very much if you can help. 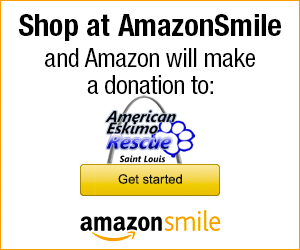 Welcome to American Eskimo Rescue (AER) of St. Louis. The loving dog you will adopt will be spayed or neutered, all necessary vaccinations, checked for heartworm, and all medical conditions as necessary. Eskies 1 yr. and under will have an adoption fee of $250, all other adoption fees are $175. Would you like to foster American Eskimo dogs? Please read on. 1. When you foster, you will give a homeless dog another chance at life — you will save an Eskie’s life. AER does not have a building and we work out of our homes, so foster families are needed to house the Eskies. 2. A foster family is a “vessel” for the Eskies until they are adopted to their forever homes. Foster families play a major role in bringing the Eskie from a dangerous situation to foster care, and finally to his or her new home. 3. You will receive gratification knowing you saved a dog’s life, and that you played a critical role in helping place a homeless dog in his or her forever home! If we don’t have a place to house them, we can’t save them. 4. You will help a family adopt a new family member – families are so happy when they adopt their new dog. You, the foster family, helped place that dog in his or her new home. What a sense of accomplishment and a significant contribution to the community – that you helped take care of and place a homeless dog. 5. Volunteering is a community project. Get the entire family involved. Children love to help take care of pets. Working with American Eskimo Rescue counts as volunteer hours too! 6. Eskie Rescue pays for all of the necessary medical work. The foster family helps transport the dog to adoption day events and vet visits. You treat the dog as if it were your own. If you wish, we can also help pay for dog food. 7. We would love to have your involvement as a foster family. Help us achieve the AER mission: To save the lives of unwanted American Eskimo dogs and place them in loving homes. Eskies know when they have been saved – your foster dog will be so thankful to you and so will we. A foster home application is available for you to fill out. Many of the reasons we at AER have to rescue dogs are because he/she was the victim of improper care or treatment. Anything from total neglect, abandonment, or abuse to simply an owner giving up a dog because it was sick and just needed proper medical care. In some cases the owners just needed ‘education’ on proper dog health care. A lot of hard work and love have to be given to a dog that has had improper care. Owning a pet is perhaps one among the biggest blessings for people at any age. Owners of these pets sometimes treat these creatures as best friends. They can be a food companion, rest companion, or play companion. These pets can also make you feel comfortable during your life’s hardest time. Indeed, pets are gifts to humans. Dogs are among the choicest of pets of the people. The owners need to learn how to care for their dogs so their pets can be the cleanest, healthiest, and the greatest dogs in the entire world. However, if you want to own a dog you need to be concerned about the dog’s health at all times. You can maintain dog health through proper dog care. It is very important to your dog. By doing the proper health care you will be able to make your dog strong and healthy. The reason why some dogs are neglected is because of selfishness of some dog owners. Only a little time is spent to caring for dogs. If dog owners do not give some of their time, energy, affection and healthy dog habits, the result is unhealthy dogs which are prone to allergies and malnutrition. It is very important for you to feed your dog with healthy foods. Never overfeed your dogs. Overfeeding leads to indigestion and overweight. It is never easy for a dog that has indigestion. You will need to bring them to a veterinarian to relieve it. Feed your dog with enough food and always on time. Never feed your dog your ‘table scraps’. This is very unhealthy for your dog as they are not designed to eat many foods you eat. Carefully prepared natural foods for your dog can be a great asset, but you must first totally educate yourself to have your dog eating ‘human’ foods. Proper hygiene care is also important to improve your dog’s health. You do not have to take him/her to bathing everyday. Use shampoo for dogs as it contains the right pH level for your dogs. Human shampoo can cause some serious problems like excessive hair fall or allergic reaction. If your dogs have fleas, treat them by using and flea shampoo. Some are not effective so you should choose the ones with the trustworthy name. Have your dog checked for Heartworm once a year by your vet. Aside from checking for any visible signs of problems with the dog, the person can do better by bringing the pet in for the regular examinations with the vet. Shots and other cleaning can be done once a year or every three years depending on the strength of the drug. Owning a dog is a big responsibility. The best way to make sure this pet will live for many years will be to provide some preventive health care. The person can read up or learn some things from the vet which will surely be useful. Never underestimate the importance of dog health.